Chicken Tikka Masala – IN A CROCK POT!!!!!! Yep, you heard me! When I saw this on Pinterest, I just had to try it. 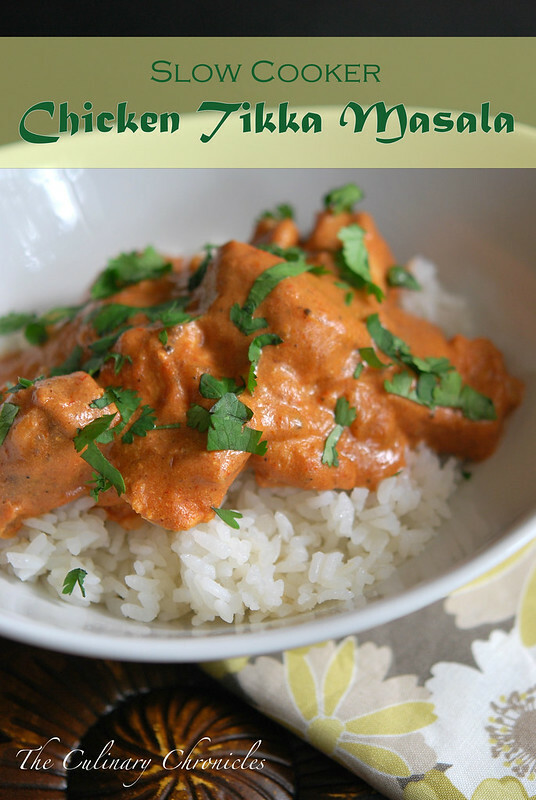 I adore Chicken Tikka Masala and although I’m quite happy with the America’s Test Kitchen adaptation that I often use, I couldn’t resist trying out a slow cooker version. True to the wonders of crock pot cookin’, I simply threw the ingredients into the pot, slapped on the lid and let the goodness work its magic for 8 hours. How did it taste? Really great! The chicken was quite flavorful and tender. As for the sauce—creamy and luscious. The only change I would make would be to reduce the amount of garam masala by half. The original recipe from Cooking Classy calls for 2 tablespoons which was pretty heavy handed for me but depending on your flavor preference (and the type of garam masala you use), you may like the full amount. And although it may not be spot on to my beloved New Indian Cuisine, it’s still quite scrumptious and you just cannot beat how darn easy it is to make. Want the recipe? Head on over to Cooking Classy.